Please read your RiscPC's manual as well as this article. Follow this gentle guide at your own risk. As a software developer, when I bought my Iyonix, I felt that I ought to hold on to my StrongARM RiscPC. Saddled with a forked OS, it seemed wise to keep a finger in each pie, and thus ensure that my software remained 100 percent reliable whatever flavour of RISC OS it was run on. The years have rolled by, and both machines have proved to be tough and reliable. To begin with, I used each machine to backup the other via a network cable. On the Iyonix, I had a 120GB hard disc but on the RiscPC only 2GB. As a large collection of MPEG videos, vast quantities of photographs and many high-quality MP3s steadily began to accumulate on the Iyonix, the RiscPC's drive soon did not have the capacity to back up the Iyonix's. I suppose a part of me has been expecting the RiscPC to pack in first, but as my Iyonix aged and the RiscPC continues to live on, I began to worry. If I was honest, quite a bit of material would be lost that I'd rather not lose if the hard disc in my Iyonix were to fail. Memories of warnings from Paul Middleton at various RISC OS show theatre presentations about the importance of backing up programs and data added to my anxiety. Last summer, here at drobe.co.uk, our editor's RiscPC hard disc failed and it was this that I took to be a final warning. I had to sort out some backup arrangements. The most straightforward solution seemed to be to replace the 2GB drive in the RiscPC with, say, an 80GB one. I gave Dave Holden at APDL, in London, a call. He quickly quizzed me on how the existing drive was connected to the motherboard. I assured him that there were no fancy hard disc interfaces in my machine and he, in turn, assured me that a RISC OS-compatible 80GB drive would be on its way to me by first class post that very day. And for less than £50. A modest price, I thought, for some piece of mind. The new drive arrived the next day in an extremely well padded box. I enthusiastically set about using my Iyonix to back up what was on the RiscPC's old 2GB drive. Then all of the connections were pulled from the back of the RiscPC and off came its lid. The RiscPC's hard disc was buried deep within the machine, but I found that by disconnecting the push on-pull off power lead to the floppy drive, I could lift the layer off that held the CD drive, floppy drive, and podule-style network card and turn it 90 degrees to lie it on its side. This without having to disconnect any further cables. The two-slot backplane happily came out of its socket on the motherboard as I did this and remained firmly attached to the large (podule) network card - this, itself, still being firmly screwed into the back of the slice that had lifted away. A cross-headed screwdriver was now needed to undo the single screw holding the old drive in place. The new one, as Dave had promised, was an exact size replacement and swapping over the power lead and the ribbon cable from the old to the new was child's play. Carefully, I reassembled the machine, inserting a second hand 128MB RAM SIM that I'd recently acquired off eBay as I did so. I pressed in the power switch. The traditional start-up message reported 128MB + 64MB + 2MB VRAM, a total of 194MB of RAM. But my pleasure was short lived. It was then that I had a "duh" moment. The new hard disc, although pre-formatted for me with a RISC OS file system, had no Boot installed on it. So the machine was running entirely from what was in its RISC OS 4.03 ROMs. This did not seem to include a networking configuration option. I had thought that I'd be easily able to set up the networking link to the Iyonix and through this pull the RiscPC's !Boot application across via ShareFS. I suppose I could have burned my !Boot onto a blank CD for transferring back to the RiscPC, but as I had my original RISC OS 4 install disc to hand, I used that. 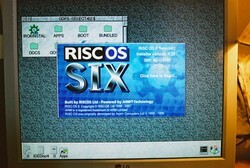 Then, using the vanilla RISC OS 4 !Boot from the CD, I set up the networking to my Iyonix. I was back on track and could now drag my old RiscPC's !Boot file back across to replace the vanilla one. My old machine, with Select 3i3, was back in town. The old 2GB hard disc had been formatted using the pre-RISC OS 4 file system that only permitted filenames of upto ten characters even although the RISC OS 4 ROMs support long file names. As a RISC OS Select subscriber, I've had RISC OS 6 for a while, but had been unable to install it as, for the first time, release of 4i2 of Select requires a hard disc that can cope with long file names. As I now had this, I immediately installed the RISC OS 6 upgrade. And so there you have it: the whole process was reasonably straightforward and a most cost effective way of backing up the programs and data on my Iyonix whilst also giving my RiscPC a new lease of life. Always keep backups with maxtors - I've had horrible failure rates with them. Now that they're owned by Seagate, I've had some bad seagates too. Sigh. arawnsley: I've always felt that, like banks, hard drive brands are very personal things. Some people hate brands that others love. Out of the hundreds of drives I've ever owned, only one has ever failed while actually in use. And it was 4 years old, so frankly fair-game. And it didn't die in a way that made all the data on it entirely unaccessable, so a backup of most of the data was easy. However, I know people have hard drive failures monthly. I have no idea how they mistreat them. However, I've always kept lots of space between drives, and had plenty of cooling. I never put drives in plastic cases, only metal ones. I replace drives every three years, mainly because I need more space or faster access by then, rather than replacing them on reliablity grounds, of course. 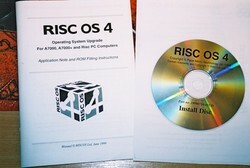 RISC OS does put somewhat more strain on hard discs that other, more modern OSes, however, due to its lack of caches: read caches prevent the load on the drive for commonly-accessed stuff, and write caches allow you to intellegently order writes to the drive thus reducing how much work the drive has to do. Perhaps this is a situation ROOL can help with. All good advice up to the last paragraph, but RISC OS is very kind to hard drives. For the vast majority of users, the drive is only in operation when loading tiny RISC OS applications and saving data, with a small burst every 15 minutes when email is fetched and debatched. The drive light is off then the rest of the time, unlike certain other OS's which constantly bugger with the HD for no good reason. The only time the lack of caches in RISC OS would make a difference to disc lifetime is if you were constantly running something like a web server with heavy usage, and there are plenty of other reasons for not doing that. druck: Stuff touches the disc all the time under RISC OS: Wimp$Scrap can get hammered when web browsing or doing lots of data transfer between apps, and that excludes things like fetching your mail and news, when compiling software, doing a clipart search, etc. Hard disc access under RISC OS isn't just limited to when you load an app or save a file. Windows, of course, does thrash the disc, but that's because it's so enormous and bloated rather than actual algorithmic faults. Some RISC OS Systems to put some more strain on the harddiscs than other computer types due to the fact that they are placed to ensure a minimum cooling of the disc despite cooling being important for the drives. In the Risc PC the disc is in the most weird spot since it is where the fan from the power supply does not really ventilate, it is not connected to some bigger metal parts which could spread the heat and it is below other parts with no space below so that there is not even a reasonable air flow due to the disc heating the air. In my ex-Risc PC I simply moved the disc to a podule slot and added a silent fan to ensure that the disc is run in the operating temperatures it was designed for and ever since I did that all my harddisc access problems vanished. In the classic IYONIX pc the hard disc placement is not much better since it is again in a place where there is not air flow due to the fan of the power supply and it is mounted directly below the floppy disc drive to ensure that you have no reasonable air flow due to the disc heating the air. OK, the harddisc mounting case is metal but so thin that as heat spreader it is close to a joke. 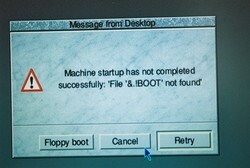 The result was (as with my Risc PC) that after longer working sessions especially in summer I got the odd disc error, easily solved by shutdown, wait a while, reboot and usually DiscKnight was happy with the disc. So I mounted the harddisc vertically near the rear of the box where the air openings are and added a hard disc cooler which I run with 5 Volts so that it is very silent. Ever since I had no more harddisc errors. Take A9home: Again the harddisc has a hard time since the case is completely closed and thus no air flow at all. Initally I assumed that the disc would be tightly screwed to the metal case so that that works as a heat spreader but by now we all know that that is not the case. Due to that I'm not surprised that the odd user already had hard disc issues with A9home. My RiscPC is now 12 years old and I've never had a hard disc failure. I've replaced the disc a couple of times with larger ones each time, but never beacuse of a failure. The current 20gb drive has been running without a problem for over five years. hzn: Indeed. While people celebrate the RiscPC case design, it's actually dreadfully thought-out inside (assuming it was thought about at all.) Other than the issue of the case being plastic and thus not acting as a heat sink (of course, originally this wasn't a problem, but modern hard discs kick out lots more heat, as well as new podules and CPU cards doing this), the things that annoyed me most was the faff you had to go to when you had more than one slice and you wanted to replace something, and the entire waste of the space above the CPUs in the extra slices. Putting the hard drive in a podule bay, however, is an excellent idea. Although I would go to some effort to make sure it is secured in place by more than just gravity. Lots of good advice here - the main thing I wanted to get across was the need for backups etc. It is tempting to think that the most recent machine or drive is less likely to fail than an old one, but that's not really the case, and can lead to a false sense of security and ultimately data loss (from experience). In reply to rjek: When I had my RPC. I found the podule bay used to secure the hdd quite well, without any other fastenings needed. rjek: "but modern hard discs kick out lots more heat"
You obviously don't remember full height drives and ST506 models, a modern drive uses a fraction of the power, and hence heat generation. Modern drives don't need much cooling or direct air flow, just that the ambient temperature is kept under control within the case. Without the several hundred watts generated by processor, northbridge, and ridiculous graphics card to have to deal with, a small case fan is adequate in most RISC OS machines. The exception being heavily expanded multislice Risc PC's, which may require a second fan. druck: I'm referring specifically to drives used in RiscPCs, here. They pretty much ran at room temperature in original models. The hard drives in my PC these days, with fans blowing over them, are hot to the touch. In my NAS downstairs, it's actually mildly uncomfortable to handle the hard drives if they've been working in the past 5 minutes. Of course, it's still within their design tolerance and they're server-grade drives anyway. I originally found this out to network some machines for a client.